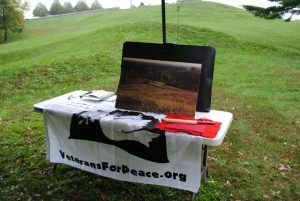 Veterans For Peace Chapter 25 member David Giffey met approximately 300 Central Wisconsin public and private school student at The Highground Veterans Memorial Park near Neillsville, Clark County, on Tuesday and Wednesday, October 2 and 3, during Highground Education Days. The children receive tours of the Highground site during Education Days. Giffey designed the Mourning Dove Effigy Mound, seen in background, and supervised its construction in 1989. This photo shows a table with information used during the tours. A brief history of Native American effigy mounds and stories about the ceremonial pipe, on red cloth on table, were shared by Giffey with the students. Middle school students from St. Mary’s, Amherst, are pictured near the Mourning Dove Effigy Mound at the Highground. 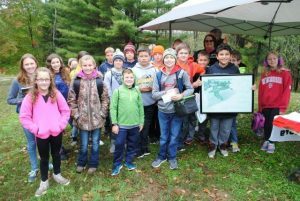 The student at front right is shown holding David Giffey’s original drawing of the mourning dove effigy mound which he designed in 1986. 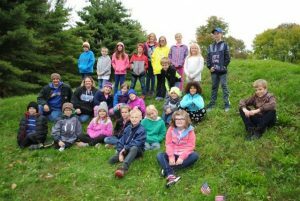 Fifth grade students from the Clark County cities of Colby and Loyal are pictured standing atop the Mourning Dove Effigy Mound during Education Days at The Highground Veterans’ Park near Neillsville. 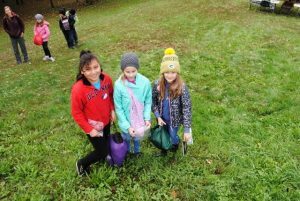 From left, Carla, Allison and Lily, are shown after they scattered soil they brought to the Mourning Dove Effigy Mound from their homes in the City of Colby when they visited the Highground during Education days. Amherst public school 5th grade students rest on the Mourning Dove Effigy Mound during Education Days at The Highground. Their teacher, Ms. Lutz, and a chaperone are pictured in middle row at left. 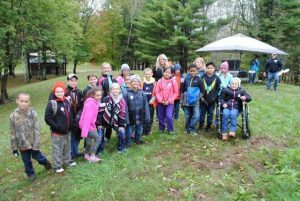 A class from the villages of Merrillan, Alma Center and Humbird rested October 3 on the Mourning Dove Effigy Mound as they toured the Highground in Clark County. This entry was posted in Clarence Kailin Chapter 25, The Highground, Veterans for Peace and tagged Chapter 25 VFP, David Giffey, Education, Highground Education Days, Peace Education, The Dove Mound, The Highground, The Highground Veterans Memorial Park on October 10, 2018 by Brad Geyer.